Over the years, I have gained a sense of myself as a photographer, finding a certain clarity about what inspires me to photograph and what I wish to communicate. Fortunately, this clarity came early in my career. 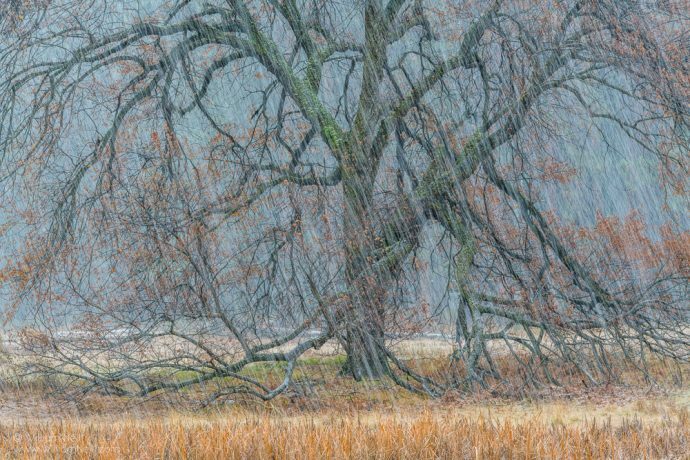 In my college years, I studied the works of landscape masters such as Eliot Porter and Paul Caponigro, who focused more on the details of nature rather than the broad, descriptive view. 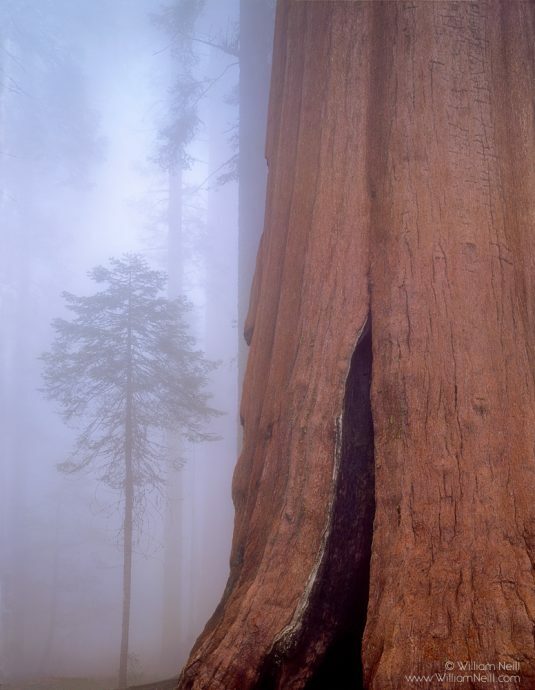 Just a few years after buying my first camera in 1974, I moved to Yosemite and never left. Living in or just outside the park continuously since 1977 has been key to my development as an artist. After a few summers working for the National Park Service, I was hired to be the photographer-in-residence at The Ansel Adams Gallery. I got to know Ansel and attended many of his summer workshop sessions, meeting other world-class photographers such as Ernst Haas, Joel Meyerowitz and Jerry Uelsmann. I started teaching photography to park visitors, taking them for daily “camera walks” in the meadow near the gallery. I learned to make my own color prints, ironically, in Ansel’s black-and-white darkroom. I listened to the photographers I met and explored this famous landscape. 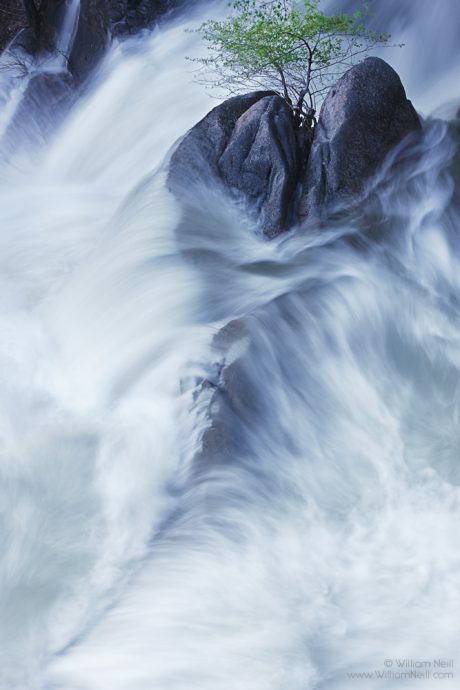 Photographers find their voice when they discover what subjects move them most deeply. That passion, that emotion from within is the magic element. An excellent way to concentrate one’s attention is to develop thematic portfolios based on those emotional connections. The first phase of this development is to see what themes exist in your photographs and which of those are the most promising, and to start editing the images into a portfolio that exemplifies your best work. There are two main requirements for an exceptional collection: there must be a coherent theme that moves you and motivates you, and there should be consistent quality. In any situation where you show your work, great images are diluted when average images are included to “fill out” your presentation. Learning to think in themes is an ongoing process that can continue for years or even decades. As you begin to assess the current level of your work, you also learn to maintain that standard of quality using your editing skills and become conscious of ways to improve your future efforts. There is no set way to do this, so we must learn to trust our own instincts and observations, and listen to the opinions of others we respect. Those instincts depend on how well we feel an image translates our vision, plus the equally subjective process of comparing our images to those of others. The titles are important because they encapsulate the ideas and passion for each theme, and guide the viewer toward those ideas. More importantly, a theme concept can inform your efforts in the field and subsequent editing sessions. When editing, you not only judge both technical and aesthetic aspects, but you consider whether the photograph adds depth and quality to your chosen theme. 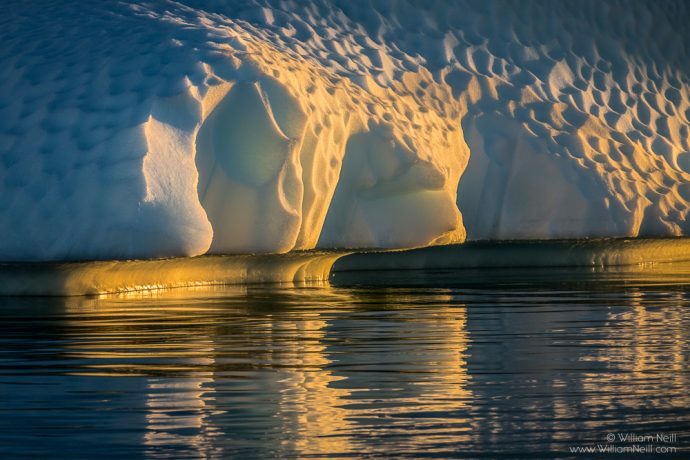 Although the Antarctica photographs were made over only a five-day voyage with Luminous Landscape, my other themes are collections created over four decades. My black-and-white images offer an example of where the inspiration began. Although I’ve gravitated to working in color, early on I was more strongly influenced creatively by black-and-white masters Minor White, Edward and Brett Weston, Wynn Bullock and Paul Caponigro. Seeing the abstract, mysterious and less-literal landscape imagery these photographers often made, I was inspired to strive for the same effect in color. Many years passed as I pursued this goal. Digital technology eventually progressed to the point that allowed for high-quality black-and-white software conversions from digital capture and scans of my color film. When a corporate art project for black-and-white murals was presented to me, I happily dove into the editing and processing of images from my 4×5 film archive. The project led me to expand my initial selections into a full-fledged theme, transforming a long-latent passion for the black-and-white landscape. 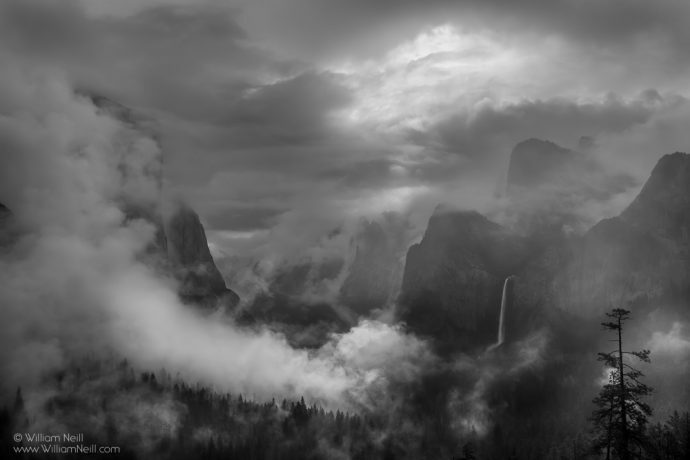 I recently prepared an exhibit for The Ansel Adams Gallery in Yosemite. The gallery has been showing my prints since 1983, when Ansel himself approved of my representation there. Each exhibition there has taken on a different flavor depending on the curator, the season and what new images I have made. When deciding what to print, I have naturally focused on showing my most creative work, but the final choices are a collaboration between myself and the curator. Each gallery I work with has a different clientele and curatorial focus and knows their customers best. 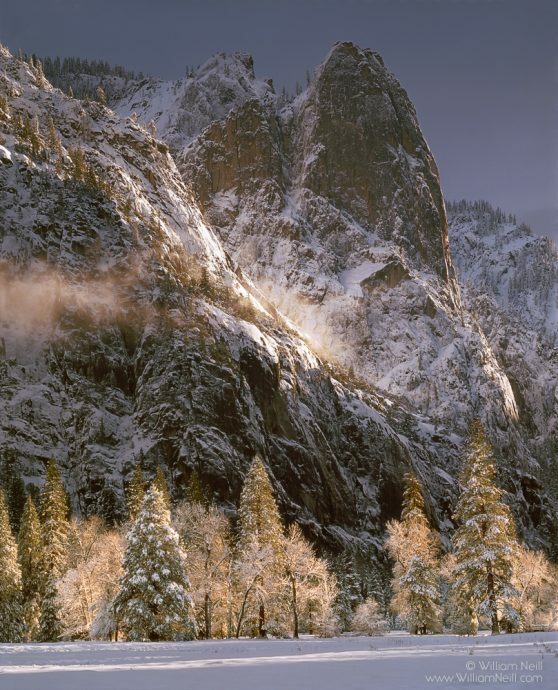 Although not entirely based on the new book, my Yosemite exhibit was a retrospective drawn from my 40 years living in and next to the park. In writing a statement for the exhibit, I wrote the following words to describe my creative process. I’ve had the good fortune of having my photographs exhibited and published over many years. The first book I illustrated was The Sense of Wonder by nature writer Rachel Carson, published in 1990 by The Nature Company. The success of this book, reprinted in nine editions, led to 10 subsequent books. Flash forward to 2017, and I have a new retrospective book revealing my four decades as a fine art landscape photographer. 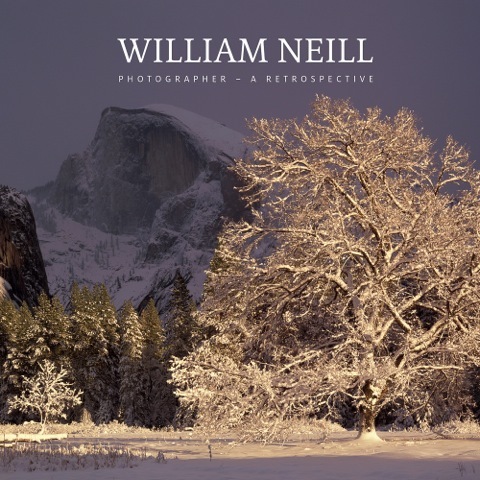 The collection, entitled William Neill, Photographer: A Retrospective features 151 images, many never before published. Included are images taken with a 35mm film camera from the 1970s and 1980s, through to my current digital captures. A significant number are photographs made with a 4×5 film camera. It is an amazing feeling as I pulled together 40 years of photography, but there is also great tension as we entered the final stretch of the book building process. Writing my essays, used to introduce each theme, was a challenge, requiring I be both concise and poignant. Essays by Art Wolfe and John Weller supplement my writings in the book. With 151 images in six chapters highlighting my themes, I hope that a sense of my artist’s journey comes through. Learn to focus on your greatest sources of inspiration. Commit to seeking your own creative vision. Consider what style or themes drive your passion to photograph, and follow that path even if it is “the long road” to success. Good luck and good light. This entry was posted on Friday, August 3rd, 2018 at 9:08 AM	and is filed under Landscape Photography. You can follow any responses to this entry through the RSS 2.0 feed. You can leave a response, or trackback from your own site. Very inspirational William will definately be getting the book . Thanks, William, for the insight and inspiration. Time for a trip back through my 15 years of images to see themes and passions there for the finding. When I first saw your photographs during my search for inspiration, I was in awe of your work. I’ve always enjoyed black-and-white photography, but I also am drawn to nature’s details in color. I want to “find my voice” and establish a presence with my work so I’m going to sort through 28 years of BW film negatives and find a theme. Thank you for this insight. 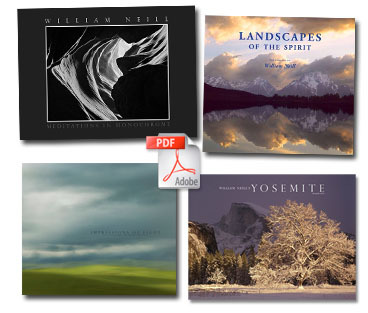 I also look for your articles in Outdoor Photography magazine; that’s where I came across your work. Warm regards! Thanks for your comments. I am so glad that you enjoy my photographs and essays!